Nepal, one of the most recent nations to become a republic, is a land locked country lying between India and the Tibetan Autonomous Region of China. As per the mythology, Nepal is as old as Himalaya and a great lake filled the Kathmandu valley. Legend has its that the lake was drained by a thunderbolt thrown against the wall of the valley by Lord Krishna. Another legend claims that the lake was drained by the patriarch Manjushri, as he wanted to get a closer look at Swaymbhu or Adhi-Buddha, the beautiful flower on the lake. But the recorded history of Nepal is centered on the Kathmandu valley and begins with the Kirantis who are said to have ruled for many centuries beginning from the 7th or 8th Century B.C. with their famous King Yalumber who is even mentioned in the epic, ‘Mahabharata’. It was the region that Prince Siddhartha Gautama was born in 563 B.C. Gautama achieved enlightenment as Buddha and spawned Buddhism. Nepal, as a state was established by an ambitious Gorkha King named Prithvi Narayan Shah, after conquering of all the Kingdoms of the valley, including Kirtipur which was an independent state by 1769 A.D. Establishing the Shah Dynasty, which ruled the unified Nepal from 1769 A.D. to 2008 A.D in the valley, Prithvi Narayan Shah made his capital in Kathmandu. King Gynendra was the last ruler of Shah dynasty, who had to abdicate the monarchy for making way the total Democracy in Nepal under the rule of democratically elected Prime Minister. Nepali culture represents a fusion of Indo-Aryan and Tibeto-Mongolian influences, the result of long history of migration, conquest and trade. Nepal is a tiny but truly one of the most beautiful countries in the world. Nepal, world’s only Hindu Kingdom covering an area of 1,47,181 sq. km and stretches 145-240 km north to south and 850 km east to west. Nepal has sizeable Buddhist minority. Within this small area Within this small area lies one the most diverse topographies and varied plant and animal life to found in the world. This is but to be expected in a country where the land rises from a lowly 67 meters above sea level all the way to the top of Mount Everest at 8,848 meters in a distance of 100 kilometers or so. 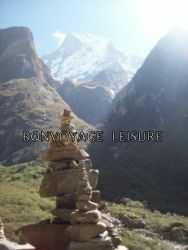 From the summit of Everest, the topography plunges to just above sea level at the Gangetic Plain on the southern border. This drop divides the country into three horizontal zones: the high mountains, the lush central hills, and the flat, arid Terai region in the south. Nepal has incredible diversity in topography ranging from a sub-tropical climate in the tarai (plains) to Alpine conditions in the Himalayan regions. Mountains, mid hills, valleys, lakes and plains dominate the landscape of this landlocked country. 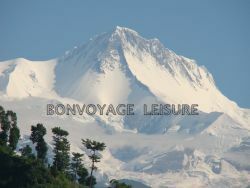 Eight of the fourteen peaks over eight thousand meters lie in Nepal including Everest, the highest in the world. 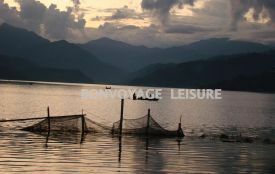 Nepal has the abundant source of natural water. Plenty of rivers originate from the Himalaya and the plateau of Tibet criss-cross the country. Nepal boasts for consisting twenty-two of the world's thirty-one highest snow-capped mountains and covers one third (35 %) of the land area of the country. Peaks like Mt. Everest (8848m), which is the highest peak in the world, and many other eight thousanders are situated in this region of Nepal. Some of the Nepal's most beautiful animals like snow leopard, Danphe (Impeyanus lopophorous) -the national bird of Nepal, the Musk Deer and plant life are also found here. The rich tapestry of the cultural heritage of Nepal is synthesized in the Kathmandu Valley. The three ancient cities of the Valley- Patan, Kathmandu, Bhaktapur-represent an epitome of harmony in urban design, elegant architecture and refined culture. These cities pack a concentration of religious monuments unequalled in the world.